The Singularity Deck is an infinitely expandable deck of playing cards that allows for an immense number of games to be played. With it you can enjoy old classics or invent new ones. Each set of cards associated with The Singularity Deck can be combined with other sets to create new and interesting card pairings. The card back design and suit icons have been made a part of the public domain allowing for anyone to design on top of the preexisting decks (find the link in my publisher description). 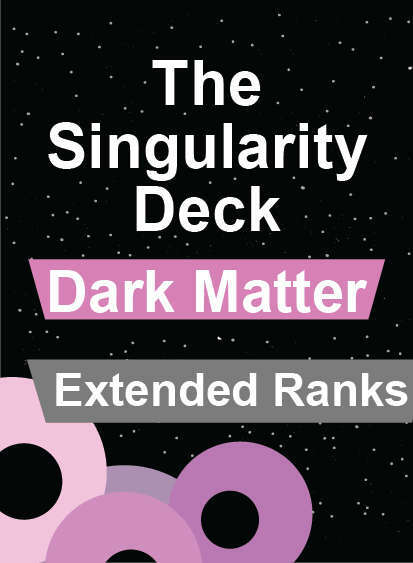 The Singularity Deck - Dark Matter (Extended Ranks) is an expansion for The Singularity Deck - Cosmos Full Set that adds additional ranks 13-24 for the Dark Matter.